This Facility is available to IORG Members only. 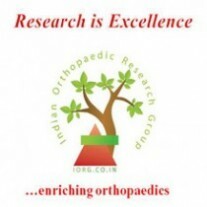 This is an Online Programme with aim to train young orthopaedic surgeons in the art of writing Scientific Papers as a part of Collaborative Authorship Programme. Phase I - Members who have newly registered with this program will be first asked to write summaries on small topics/ concise reviews. Articles and topics will be provided by IORG Team. Reviewing and editing of the article will be done by IORG Team and the reviews will be Published online in form of a online publication. The IORG member who has worked on the publication will be identified as the primary author of the publication and will be given due acknowledgement. To complete this phase the member has to attend one Basic Course in Research Methodology organised by IORG. Phase II - After Finishing at least 10 assignments (or as decided by IORG Core Committee) in Phase I, the member will be then enrolled into Phase II. Here he will be involved in preparing manuscripts for IORG Updates and also in writing review articles. A team of 3 members who have completed the Phase I will be formed and articles and guidelines will be provided to write a review article. Guidance will be provided by IORG team. These reviews will be published online at various platforms including IORG website, IORG Updates and IORG Journals. Authorship will be distributed among the team working on the publication and final decision will be taken by IORG Core Committee. To complete this Phase the Member has to attend the Advanced Course in Research Methodology organised by IORG.